This document attempts to describe 2D displacement mapping. This technique has a wide variety of uses, as will soon become obvious. The reader is not expected to have any real knowledge of writing OpenGL shaders but the details of creating/loading shaders, creating an OpenGL context, etc, are out of the scope of this document. Displacement is essentially about affecting the position of a thing using another thing, as shocking as that may seem. In less silly terms, displacement mapping is about affecting the position of parts of an object (vertices, pixels) by using values obtained from a displacement map (usually a texture in current graphics systems). 3D vertex displacement is used by artists to produce extremely complex models using only simple meshes and textures. 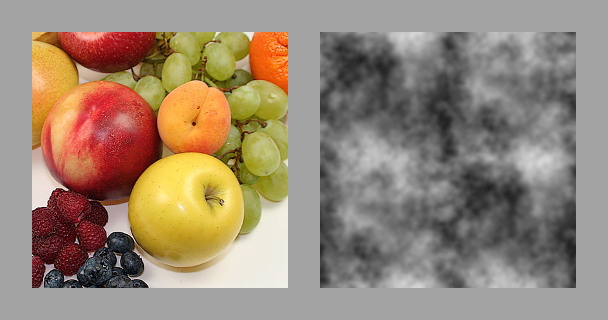 Look up the pixel P at coordinates (s, t) in an associated greyscale texture. Interpret P as a value in the range -0.5 .. 0.5 inclusive. (Optionally) Multiply P by some configurable maximum M.
The actual (s, t) coordinates used can be picked at random or, more commonly, can simply be the texture coordinates associated with each vertex in the mesh as is normal with any textured model. Higher values of M result in more pronounced displacement. 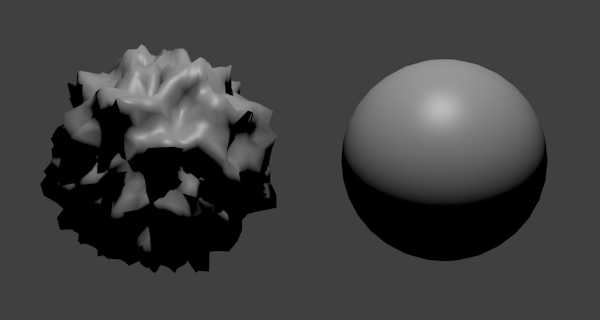 The displacement map/texture used in the depicted example is a randomly generated greyscale noise texture. Interpret P as a value in the range 0.0 .. 1.0 inclusive. The actual (s, t) coordinates used are the (x, y) coordinates of the corresponding pixel in the image being displaced. Displacement, then, isn't the act of modifying pixels, but the act of modifying the coordinates that would have been used to select pixels. 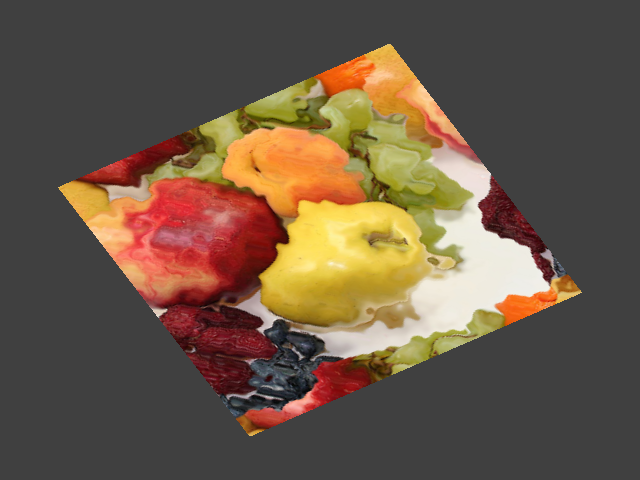 Modern OpenGL implementations allow for rendering to textures via the use of framebuffers. The programmer allocates space for an RGBA texture, creates a "framebuffer object" and then attaches the allocated texture to the framebuffer object as storage space for the color buffer. The programmer then "binds" the framebuffer object and performs rendering commands as normal. The output produced by the commands is written to the texture as opposed to the screen. This texture can then be used in subsequent rendering commands like any other texture. The rest of this document consists of examples of combining 2D displacement mapping and render-to-texture techniques to produce a range of computationally inexpensive and deceptively complex-looking effects. Examples are given in the Java programming language for the sake of keeping code platform independent, but no Java-specific features are used and programs should be easily understood by programmers of other imperative languages (C, C++, Ada, etc). The OpenGL library used is LWJGL. The example code uses OpenGL 3.0 but does not use anything that is not present in OpenGL 2.1 other than framebuffer objects. Porting this code to OpenGL 2.1 is simple: see the ARB_framebuffer_object and/or EXT_framebuffer_object extensions. The shaders used are GLSL 1.1 compatible. For the sake of keeping the code short and simple and to avoid depending on external libraries for what should be short tutorial code, the example programs use the immediate mode glBegin()/glEnd() functions to specify vertices and also the traditional OpenGL matrix stack. The Ripple program takes two images as input: an image to be displaced and an image to be used as a displacement map, and displays a textured polygon with an animated "rippling" texture. The texture is animated by modifying the texture coordinates for the displacement map over time. It is possible to obtain a huge range of interesting effects just by using different displacement maps. 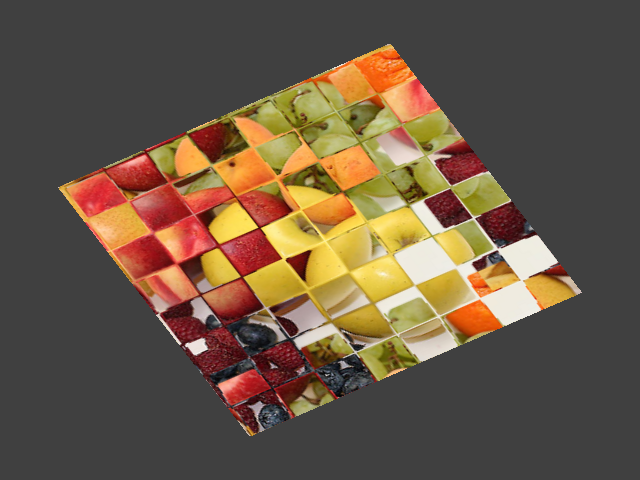 The program takes the current texture coordinates (interpolated by the current vertex shader), a texture, a displacement map, a scaling value (maximum), and the current time (in frames, but the time unit is not important). 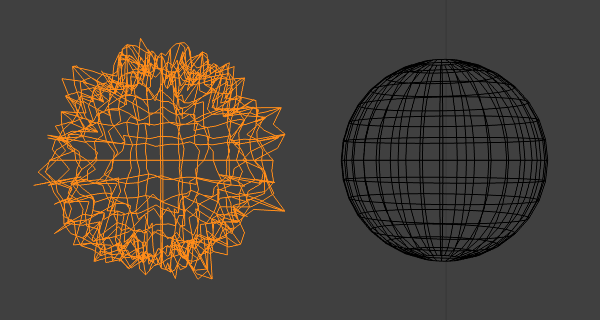 First, the current texture coordinates vertex_uv are translated by the current scaled time value time_e. Then, a pixel is read from the displacement map at the resulting texture coordinates. The displacement map is assumed to be greyscale. Pixels are represented as four element RGBA vectors with floating point components. The shader reads the green channel of the pixel (but would of course get identical results reading from either the red or blue channels with a greyscale image), and then scales this value by maximum to obtain a final offset value displace_k. 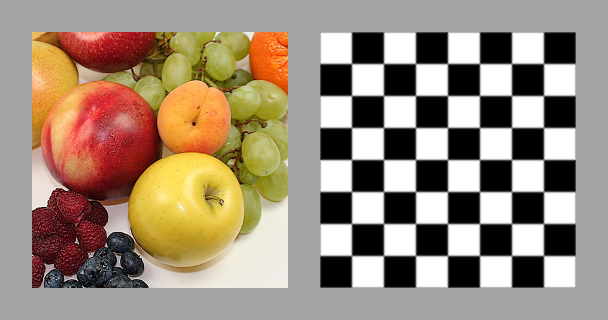 Note that this value is in texture-space units, not pixels - in a 256x256 pixel image, a value of 0.25 would represent 64 pixels. The program then adds displace_k to the original interpolated texture coordinates and then retrieves a pixel from the current texture using the coordinates. The OpenGL program that drives the shaders is similarly simple. First, the program allocates a framebuffer and adds a blank texture as color buffer storage. It loads the requested image and displacement map image, and also compiles and loads the relevant shading programs. These uninteresting but essential functions are implemented in the Utilities class. Rendering involves two steps. 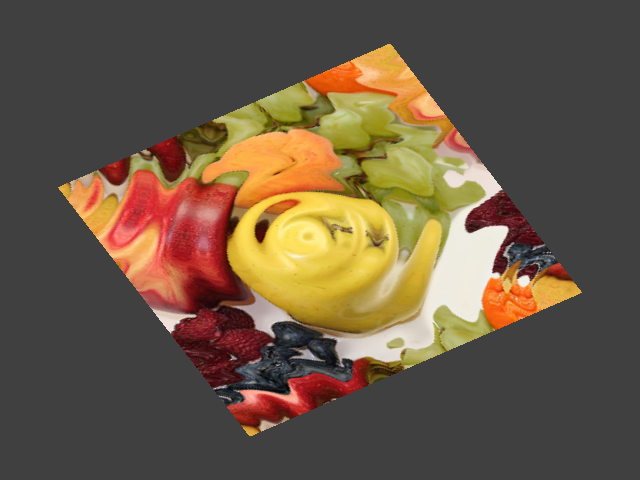 First, the program needs to generate a texture based on the loaded image and displacement map. It does this by binding the allocated framebuffer and then rendering a fullscreen textured quad using the previously mentioned displacement shader. It is, of course, possible to render directly to the screen using the displacement shader. The program described here avoids doing that in order to demonstrate that the resulting procedural texture is an ordinary texture that can be used in the same manner as any other. 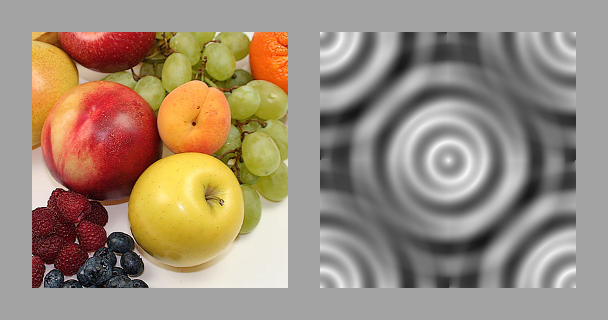 A simple extension of the Ripple program with multitexturing and blending, results in the Caustics program. The program works almost identically to Ripple, but takes an extra texture as input. One of the textures is modified through displacement mapping as before and then layered over the top with trivial alpha compositing. When fed the image of ceramic tiles, a transparent "caustics" texture, and a cloudlike displacement map, the program gives a believable approximation of the effect of sunlight shining through water onto the bottom of a swimming pool. Most of the program's source code is the same as before. The program loads all necessary textures and shaders, and creates a framebuffer. The only significant differences are the extra texture and the use of the multitexturing shader that simply blends and applies two incoming textures. Now, framebuffer_texture contains a transparent displaced texture. Rendering the scene now only differs in that the texturing shader applies two textures to polygons instead of just the one. The shader takes extra parameters controlling how the textures are to be scaled, and a parameter that controls the degree of alpha blending. 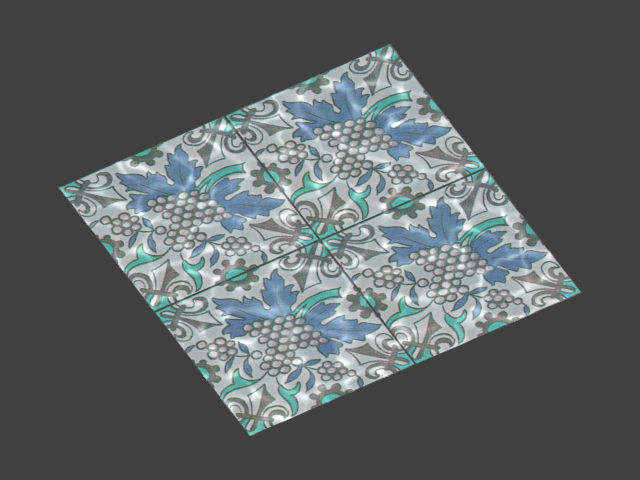 In effect, the "tile" texture scaled by 50% and applied to the textured quad, and then the transparent "caustics" texture is applied over the top at 40% opacity.